These days, a lot of people are going back to school. If you’re in business, maybe in middle management, what you’ve heard is true – the best way for you to advance is an MBA. Workers with an MBA make much more than those without, get to higher positions, and have more job security. Because of the world that we live in, you’ve likely considered an online program to get your MBA, and those have their benefits, but stop and think for a moment. Online programs aren’t for everyone. You have to be extremely self-motivated, comfortable with technology, and satisfied with not really getting to know your instructors and classmates face-to-face. And if that’s you, go for the online degree – it’s flexible, convenient, and usually fast. But maybe you’re not that person. If you value real-world contact more than convenience, or like the give-and-take motivation that working directly with others gives you, you may look forward to the community that a residential MBA program offers. Because your real strength is networking, you’re at your best face-to-face; real life is where you shine. 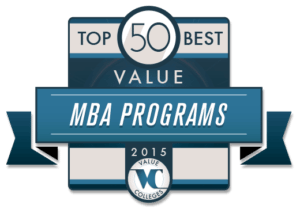 If that’s you, the Best Value Top 50 MBA list is for you. We’ve made one limiting decision: all of these schools have program costs at or below $100,000. While that decision, unfortunately, artificially counts out some colleges that, because of their superior scholarship and financial aid packages, would be considered great values, we stand behind the decision because it allows us to highlight some top values that don’t always get their due. Salary data was sourced from 2014-15 Payscale.com’s Annual College Salary Report. We chose to use Master in Business Administration for statistical purposes, as all our schools have general Business Administration as a Major. Degrees in, for example, Accounting or Management, will slightly change the outcome. In the event an MBA salary was not reported, we took the median MBA salary reported from the city in which the school is headquartered. 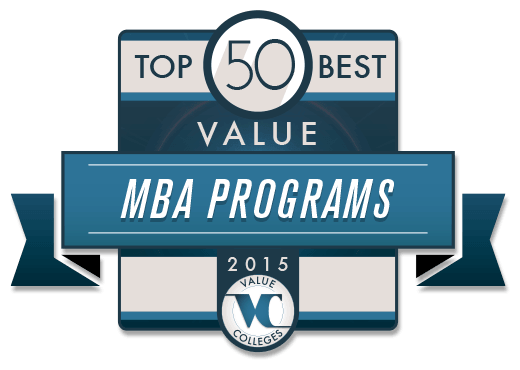 Brigham Young University, in Provo, Utah, is our #1 pick for best value MBA program. Several factors work together to make BYU a great value. They are one of the most affordable schools in their class (large, private research universities), with robust financial aid opportunities, and, for residential students, Provo’s affordable cost of living means students can get their degrees with minimal, if any, debt. BYU graduates benefits from a massive, extremely close-knit and loyal body of alumni, meaning that the Marriott School of Management does precisely what a good business school should do – help students network and make connections to get well-paid employment after graduation. Thanks to their excellent preparation, and this network of alumni, around 95% of graduates are employed within three months, with a median salary of $97,000. Specializations for the MBA include Entrepreneurship, Finance, Global Supply Chain, Marketing, and Organizational Behavior/Human Resources Management. With so many factors in their favor (and that’s not even mentioning accolades from U.S.News & World Report and the Princeton Review), it’s no wonder Brigham Young University comes in as a great investment for your MBA. Indiana University’s Kelley School of Business offers an MBA that anyone would consider a prime investment. Seven majors are available, including Business Analytics, Supply Chain and Operations, Entrepreneurship and Corporate Innovation, and others, so students can specialize in the most in-demand fields and increase their market value. From the very beginning of your program the Kelley School focuses on career development, with a collaborative cohort and personal career coach all working together to make you an asset. And it works – more than 95% of graduates have a job within three months of graduation, prompting both Bloomberg Businessweek and Financial Times to cite IU’s career services. Plus, Indiana University’s location in Bloomington, IN, will put you in, quite simply, one of the greatest college towns in the US, praised by sources as diverse as National Geographic, Bicycling Magazine, The Advocate, and the New York Times, for their culture, recreation, and food (food comes up a lot). That’s one of those side benefits to attending as a residential student. IU also makes military veterans very welcome, with many programs designed to reach out to service members. It’s always a surprise to see Ivy League schools on a best value ranking, but those in the know realize that, whatever the sticker price, the Ivy League is dedicated to getting the best students, and their large endowments and prodigious giving allows them to provide financial support so that any student can graduate with little or no debt. Dartmouth’s MBA is built around team projects, interactive learning, experiential and experimental teaching styles, and rigorous reflection and analysis. It’s an elite group, and a challenging program with unique developmental benefits. Dartmouth’s semi-rural campus near Hanover, NH, is regarded as a familial, supportive environment, where even many graduate students choose to live on campus. As the smallest Ivy League school, students are encouraged to develop close relationships with one another and with their professors, creating a powerful bond that extends to Dartmouth’s successful, widely-dispersed alumni, meaning that a degree from Dartmouth can be a calling card for your career and an investment like no other. Georgia Tech’s location – Atlanta, GA – puts it in a world-class business and finance center, with everything from tech, to banking, to entertainment in one of the fastest-growing economic powerhouses in the world. It should be no surprise, then, that an MBA from Georgia Tech would be a great investment in a business career. There are several reasons; in addition to location, which gives students access to internships, part-time work experience, networking, and post-graduation employment (second only to New York City), there is also Tech’s tuition, which, as a public university, is significantly lower than many private tech institutions. A high average salary for graduates, with a high ROI, means that any debt students incur can be paid back more easily. Acclaimed as one of the most important institutions in the world by U.S. News & World Report, Georgia Tech offers Scheller students a degree that will get them far, not only in the tech industry, but in any business capacity. The top business school in Texas, UT Austin’s McCombs School of Business, offers an MBA that is also a proven value. First of all, there are six programs to choose from, from the Full-Time, Evening, and Executive MBA tracks, to extension programs in Houston, Dallas/Fort Worth, and Mexico City. Students in the Full-Time MBA can choose from six concentrations, including an Interdisciplinary concentration to specialize in an unconventional or more specific area, and a cohort system, with stable study teams, help students work their way through the program while developing relationships and networking. A dizzying amount of opportunity for experience, from workshops and competitions to Fellows programs and internships prepare students for their career from the beginning of the program, while UT’s Austin location puts it in proximity to some of the biggest corporations in the world, including National Instruments, Dell, Whole Foods, and others for a start to your post-MBA employment. With numerous opportunities for financial aid, including scholarships, grants, assistantships, and loans, McCombs provides graduates with a high rate of job placement and innumerable benefits to make a UT MBA a top college value. The Mays Business School, at Texas A&M University, offers a full-time MBA program from a university acknowledged as one of the best public institutions by U.S. News & World Report, Financial Times, Bloomberg Businessweek, and Forbes. With a focused, intensive program, students can complete their MBA in as little as 16 months, or continue with more courses to build their experience and credentials in specializations such as E-Commerce, Real Estate, Consulting, and more. Again, Texas A&M demonstrates the special attention a residential business school can give, with a spouse’s group to support the family of MBA students, numerous extracurricular clubs, and a familial cohort. A&M is also recognized as a military friendly university, as well as a welcoming environment for Latino students, two segments of our populace who can benefit from the professional entry an MBA provides. Texas A&M’s Mays Business School is a value and an investment in a bright future. Only one other business school matches the University of Wisconsin’s School of Business for the number of Fortune 500 CEOs on its alumni list: Harvard. That’s impressive company, and only one indication of Wisco’s quality and influence. With the Wisconsin MBA, students can choose from specializations in areas such as Operations, Real Estate, and Marketing, as well as a rare and unique Arts Administration specialization for students who wish to work in management for the fine arts, theater, recording, and other culture industries. During your time as a student, you’ll get to experience Madison, WI, widely considered one of the best places to live in America. The UW MBA is affordable, and with a wide range of alumni and corporate connections, a strong average starting salary for graduates, and a high job placement rate, any costs are likely to be offset by their benefits, meaning a high return on your degree investment. If “UNC MBA” just seems to roll of the tongue, know that Bloomberg Businessweek, Forbes, and U.S. News & World Report seem to think so too – UNC’s Kenan-Flagler Business School certainly shows up quite often on their best-of lists. With an intensive, challenging, and demanding educational environment that rewards innovation and brilliance, with a community of motivated students who push each other farther than any individual, the Kenan-Flagler school produces graduates ready for anything the business world can send their way. UNC’s excellent resources give students unrivaled experience and global opportunities, along with financial aid that allows many students to graduate with no or little debt, increasing the value of a UNC degree. Plus, residence in Chapel Hill, one of the most beloved college towns in the US, is one of those unquantifiable extras that make a good investment into a great one. The Smeal MBA, from Penn State’s Smeal College of Business, is one of the best investments you can make in a graduate degree, if you’re looking for a job that will start paying off your student loans right away; according to Bloomberg Businessweek, Smeal is one of the business schools that the Fortune 500 is more keen to actively recruit, and their massive corporate network grows every year. Concentrations include Healthcare, Sustainability and Social Innovation, and Strategic Leadership, among others, and with a one-week global immersion experience students are prepared for a career in today’s international business world with trips to locations such as China, India, and South Africa. Numerous student organizations, access to several major business hubs, and a rewarding life in State College, PA, creates an environment of camaraderie, collaboration, and community, making an investment in the Penn State MBA an investment in every aspect of your life. The Rawls College of Business at Texas Tech University offers several MBA programs including the STEM MBA, MBA for Working Professionals, MBA with an emphasis in Health Organization Management, and a Dual Degree MBA (student chooses another master’s degree in conjunction with the MBA). The Rawls College is an internationally recognized institution with its main objective to create future leaders within the business world. National rankings have featured Rawls as a Best Business Program (U.S. News), a 2015 Best for Vets (Military Times) school, as well as a 2014 Best Business B-Schools (Bloomberg Businessweek). The Foster School of Business, at the University of Washington, offers many options for an MBA degree. In addition to the Full-Time MBA (a conventional 2-year MBA program) and the Evening MBA (a part-time, 3-year program), Foster also offers an Executive MBA designed for future corporate leaders (a 21-month program) and two accelerated specialist programs: the Technology Management MBA and the Global Executive MBA. With so many options, all of which have been cited by U.S. News, Bloomberg Businessweek, Financial Times, and/or the Economist, there’s sure to be something that fits every working adult’s lifestyle. Foster has many clubs and special events intended to increase and make the most of their diversity, including Minority Business Awards, Association of Latino Professionals, and Foster Women in Business, to name just a few; that dedication to diversity means a strong, well-rounded education as well. With all of these impressive stats, you hardly even need to know that UW’s job placement and average starting salaries rival the Ivy Leagues to realize that the Foster School of Business is a prime college value. With high rankings from U.S. News & World Report and the Economist, the University of Florida’s Hough Graduate School of Business offers a number of MBA options with excellent reputations. The Traditional MBA, focusing on general business expertise, is offered in both two-year and a one-year accelerated formats, with concentrations including Strategy, Finance, Supply Chain Management, Marketing, and Real Estate and Urban Analysis. Career accelerator programs help students develop further specialized skills in intensive, hands-on projects. For working professionals who cannot take away time from their careers for full-time schooling, the Professional MBA and Executive MBA are designed in more convenient, flexible formats, including weekend and evening courses. Whatever path you choose, you can be confident knowing that UF’s graduates have high job placement rates and starting salaries, so your degree can start paying for itself right away. With March Madness just past, it’s important to note that UConn isn’t just about basketball: it’s also named as a Public Ivy and one of the best public universities in the US, with excellent programs in law, medicine, and, of course, business. The UConn College of Business offers an MBA with unique accelerator programs (one-semester practicums) in finance, innovation, Sustainable Community Outreach and Public Engagement, and a Student Managed Fund of over $2 million. For resident students, life in quiet, quaint Mansfield, CT could be soothing, and a safe place to raise children if you’re bringing a family on your MBA trek. UConn boasts a 94% job placement rate for MBA graduates, with a high initial salary and ROI, making UConn’s MBA a top choice for education investment. The Krannert School of Management, at Purdue University, explicitly seeks students motivated to build their STEM background into business careers in the modern, technology-driven economic world. The traditional 2-year MBA features 14 possible concentrations, more than almost any reputable program including Manufacturing/Technology, Strategic Management, and Operations, as well as more common heavy-hitters like Finance, Accounting, and Marketing. But Purdue also offers an exciting MBA for STEM one-year accelerated program, dedicated to helping STEM professionals develop business skills to advance in management for science and tech organizations. This is a unique program not commonly found in business schools, and one well worth considering for STEM majors, considering the massive shifts in the 21st century business world. Finally, West Lafayette, loved for its Midwestern community spirit, will help you through those challenging years as you work toward your degree, knowing that you’ve chosen a college value. High marks from Businessweek, Forbes, and U.S. News & World Report put the Broad Graduate School of Management, at Michigan State University, on the map as a top college value. Broad offers a traditional Full-Time MBA and an Executive MBA (meeting on weekends for busy working managers and professionals). The Full-Time MBA offers concentrations in Finance, Marketing, Human Resource Management, and Supply Chain Management, while the Career Services Center helps students build their personal worth for employment after graduation. And here’s some more good news – average time for Broad graduates to pay off grad school costs, according to Forbes: 3.3 years. That tells you MSU is doing something right. The Fisher College of Business, at The Ohio State University, proves its standing as a college value with high job placement rates and high average starting salaries, demonstrating the demand for Ohio State graduates in the work force. Acceptance to the full-time MBA is kept small so students can develop close, binding connections that will help them get through the rigors of the program, and help them help each other after graduation. Seven different majors, including Financial Reporting and Analysis, Strategy, Leadership and Organizational Behavior, as well as the opportunity to design your own major, prepares students for specialized work in lucrative fields, while a number of organizations, projects, and global opportunities provide valuable perspectives on a complex world economy. Hold on to your hat, because UT Dallas has a lot of MBA options from the Jindal School of Management. The Full-Time, Executive, and Professional Evening are all cohort programs, so students start out with a select group of fellow students and track through the program with those same people, building trust and collaborative skills along the way. The Professional Flex MBA, on the other hand, is self-paced – you choose your own classes and work your way through at your own pace. Then there are the concentrations, 15 in all, including not only the expected specializations like Finance and Marketing, but more unusual offerings like Energy Management, Internal Audit, and Strategic Management. And then, the specialized versions of the Executive MBA, including the Global Leadership, Physicians, and Project Management Executive MBA programs. With that many choices, if UT Dallas doesn’t have what you’re looking for, you must not be looking for an MBA. And that would be a shame, because the Jindal School is acclaimed by U.S. News & World Report, and job placement and salaries prove that UT’s MBA is a great college value. Emory University’s Goizueta Business School (named for a former Coca-Cola executive) offers a number of MBA options, including one-year and two-year full-time MBA programs, a weekend Executive MBA, and an evening MBA. In addition to high rankings in Businessweek and U.S. News & World Report, Goizueta also ranks at the top in job placement for graduates. Goizueta’s diversity strategy means that Goizueta is committed and determined to build a program that welcomes and benefits students from all backgrounds, creating an education that values different perspectives and thinking. With great job placement, diversity, and options, Emory’s Goizueta Business School is an investment that you will not regret. Here’s one of those cases, which often happens with business schools, where location is crucial: College Park, MA, home of the University of Maryland’s Smith School of Business, is on the doorstep of Washington, DC, which you may know as the nation’s capital. Obviously, DC isn’t all politics – it’s also one of the most important business centers in the world, making an MBA from the University of Maryland a prime spot for internships, networking, and post-graduate employment. Highly regarded by Financial Times and Businessweek, the Smith School of Business offers one of the top Full-Time MBAs in the nation, along with Part-Time and Executive MBA programs. While out-of-state tuition is noticeably more than in-state, high job placement rates and average starting salaries mean students will be able to pay off any debts they incur pretty quickly, while heading into a satisfying, rewarding career with a top college investment. The University of Pittsburgh’s Katz Graduate School of Business offers a one-year MBA (a format pioneered by Katz), a conventional two-year program, and a more flexible part-time MBA. Students can choose from more than 15 specializations in areas such as finance, information systems, and operation. Highly ranked by Forbes, USN&WR, Businessweek, and others, the Katz Graduate School of Business has roots going back to 1907, when the University of Pittsburgh began its first business school, and that long history of excellence continues today for students looking for a top value investment in an MBA. The Carlson School of Management, at the University of Minnesota, is solidly ranked by the major ranking organizations, such as U.S. News, Forbes, and Businessweek, and offers several unique MBA options. In addition to the traditional Full-Time and Part-Time MBA programs, the University of Minnesota also offers Executive MBA programs at home in Minneapolis, as well as China and Vienna, Austria. These international programs demonstrate Carlson’s commitment to global business, but if you’re more interested in the domestic degree, there are still six specializations to increase your market value, including Healthcare, Information Systems, and others. Carlson is also actively recruiting military veterans, developing programs to help vets adjust more smoothly to academic and civilian life, with plans to continue aggressively expanding their services and proportion of veteran students, so the University of Minnesota is another good choice for servicemen and women. While Athens, GA, isn’t in the heart of Atlanta, like Georgia Tech (above), it’s in close enough proximity that over 90,000 UGA alumni live and work in Atlanta. That’s a big network of alumni, and being close to a business hub that rivals New York City means more opportunities for employment in some of the highest-paying, most desirable companies in the world. Nine Full-Time MBA specializations, including Risk Management, Human Resources Management, and others, gives Terry College of Business students the skills they need for a wide range of careers. UGA, being a state university, charges considerably more for out-of-state residents, but considering the quality of education (ranked by everyone that matters) and the solid ROI and salary averages for graduates, it’s a smart investment wherever you’re coming from. Recognized as a top business school by U.S. News & World report, the University of Illinois College of Business offers an MBA degree that delivers on its promise as a great value. While there are some pre-designed specializations, from the conventional Finance and Marketing to more unique offerings like Strategic Management and Corporate & Social Responsibility, the Illinois MBA is notable for its liberal customization policy, allowing students to take courses from across the university to make their degree specific to their desired career. Besides the obvious benefits of the educational quality, there are also other advantages unique to the University of Illinois – for one, the largest alumni network in the US, meaning a huge number of committed, loyal graduates in pretty much every job sector looking for new Fighting Illini to come up in their employment searches. When networking and relationships are so important to finding work and making the most of your potential, that’s a value that can’t be denied. Much like the University of Georgia above, the University of Notre Dame, in lovely South Bend, Indiana, is near a major financial, manufacturing, and business capital, Chicago. That proximity gives Notre Dame graduates a leg up when it comes to entering the work force, because the opportunity to make connections and network is an essential part of the MBA experience. Notre Dame’s reputation is as high as the Ivy League, and an MBA degree from the Mendoza College of Business is its own best advertising. With 1-year, 2-year, and Executive MBA programs, as well as a number of dual MBAs (law, science, and engineering), students can get as specialized and intensive as they wish, with the potential of Notre Dame’s high ROI, excellent job placement rate, and ample average starting salary for graduates as proof of Notre Dame’s status as a world-class investment and value. It would be shocking if a university established by and named after 19th century lord of industry Cornelius Vanderbilt did not have an excellent business school. Of course, Vanderbilt University, in Nashville, TN, has the Owen Graduate School of Management, a permanent member of the top 10% of business schools according to every significant ranking publications, from Bloomberg to U.S. News and everything in the alphabet in between. The Vanderbilt MBA is a 2-year program, but don’t call it conventional – it is designed in a modular format, with intensive 7-week courses set up to send you into your specialization early on. Concentrations include Finance, Human and Organizational Performance, and strategy, and further electives allow students to specialize more deeply. Vanderbilt’s job placement is stellar at 94%, and an average base salary for graduates at over $100,000 means that the Vanderbilt MBA will begin paying for itself in no time. SUNY Buffalo has the reputation of a Public Ivy, with its School of Management earning high marks from U.S. News & World Report, the Princeton Review, and Businessweek, among others. The UB MBA has a recently redesigned curriculum more suited to contemporary business, and students can choose from full-time or accelerated programs. With an annual trip to China, the LeaderCORE leadership certification program, speaker series, a corporate mentor program, and numerous other career building opportunities, the UB MBA prepares students for a variety of positions, with skills to take on almost any role in corporate and business life. SUNY Buffalo’s combination of great preparation and great value make it a top investment. If you’re interested in a residential MBA program – and obviously, you are – UC Irvine, located in California’s Orange County, offers more than just a great education and excellent job prospects: it offers Orange County, one of the sunniest, mildest climates in the world, with beautiful beaches just around the corner perfect for an active lifestyle. Of course, it also has the other things; with a curriculum designed around Strategic Innovation, Information Technology, and Analytic Decision Making, an MBA from the Merage School of Business prepares students for careers in the future, not just the now, and for a place in the many forward-thinking and growing businesses in Orange County, home to some of the most technologically advanced industries. Along with internships and inspiring international trips, UC Irvine’s MBA offers unique access to high starting salaries and a great ROI, with your career success the greatest outcome. With full-time, part-time, and executive MBA programs, Arizona State’s Carey School of Business has the full suite of options for students, with ten concentrations (and soon to add Sports Business). But it also has many of those less tangible advantages that give an MBA its real value. For instance, the Carey MBA program is kept small, so students can develop close, lasting relationships with one another and with their instructors, a benefit when they enter the job market. ASU’s location in Tempe, a suburb of Phoenix, also puts the school in close contact with the strong and growing business community of that metropolitan area, a prime location for networking, internships, and employment. The Executive Connections program pairs students with coaches and mentors from the business world, providing students with an opportunity to shine and impress the people who could help them take their first steps into the business world. With all that, plus reasonable tuition, high average starting salaries, and a solid ROI, Arizona State is a serious college value. The Haslam College of Business, at the University of Tennessee at Knoxville, is ranked highly by U.S. News & World Report and Businessweek, as are many schools, but also finds a spot in the top 100 business schools according to an academic study by UT Dallas. Haslam’s program takes 17 months, a short time to fit in not only coursework, but internship and study abroad. Students can even practice consulting engagements. Graduating students have employment within three months of graduation, 91%, a solid, encouraging statistic. This is largely due to the efforts of the Career Development staff, an office dedicated to getting students into the workforce. Plus, residential students get the benefit of living in Knoxville, recognized by Forbes as one of the best small cities to live and work. The Jenkins MBA, from NC State University’s Poole College of Management, is highly ranked by Bloomberg Businessweek and U.S. News & World Report. With both Full-Time and Professional programs, students can immerse themselves in their education, or continue to work and schedule around their current jobs. In addition, NC State is one of the three central institutions (with UNC and Duke University) that make up the Research Triangle, one of the main hubs of business, technology, and innovation in the US. That means impressive opportunities for internships, and aggressive recruiting from RTP firms looking for the best and brightest. That, of course, translates to high average starting salaries and a consequently high ROI, making a degree from the Poole College of Management hard to beat. The University of Cincinnati’s Lindner College of Business puts a premium on flexibility for its MBA program. Students can earn their degree in any way that works for them, whether powering through in 12 months full-time, stretching the time out to 16 months with an internship, or choosing a part-time, self-paced approach; they can take those courses on different campuses, combining day, evening, or weekend classes, or mixing on-campus and online courses. Students with a BBA can even waive core classes in exchange for more targeted electives, and earn graduate certifications in everything from taxation and finance to interdisciplinary fields. With all of those options, and a concerted effort to raise their profile, it’s no surprise that the Lindner College and the University of Cincinnati have leapt ahead in rankings by U.S. News & World Report and Bloomberg Businessweek. This is a program on the move, and its great value now will only increase, like any great investment. The Rutgers Business School MBA, from Rutgers University, has the distinction of being named the best public MBA in the NYC region by U.S. News & World Report, and there’s something very important in that statement: the New York City region. If one of the main objectives of an MBA program is to provide connections to the business world – and it is – the New York City region may be the single most important area. Students can choose a traditional full-time MBA with many concentrations, including Analytics and Information Management, Pharmaceutical Management, and Global Business, or the Flex MBA (formerly part-time), for working professionals who wish to earn a degree while keeping their current job. Rutgers’ superior career services, with strategic partnerships with major businesses in New York and New Jersey, help ensure that students will graduate considering their degree well worth the investment – with a high-paying, satisfying career as the return. The Tippie School of Management, at the University of Iowa, offers a full-time MBA that has been recognized as one of the best in the US by Financial Times. This up-and-coming program has been designed around leadership and real-life problem-solving, with individual coaching, relationships with working executives, and highly involved career centers. There are three Career Academies, similar to concentrations at other business schools – Finance, Marketing, and Strategic Innovation – and students can also major in one and minor in another for a broader experience. The priority Tippie places on global business can be seen in the fact that all full-time MBA students are required to take an international trip, to locations including China, Dubai, India, and many more. Iowa’s high-quality education adds up to a great college value. Located in Winston-Salem, NC – a corner of the Piedmont Triad, a historical manufacturing and transportation center growing into a major metropolitan area – Wake Forest University is also a stone’s throw from Charlotte, one of the banking and finance capitals of the US. That means high starting salaries and great job placement opportunities, as evidenced by Financial Times and the Economist. With interest growing by leaps and bounds, Wake Forest has recently made the bold decision to end the full-time MBA to focus on the more flexible evening and weekend programs, including courses in Winston-Salem and their Charlotte campus. These changes will incorporate changes to the School of Business that will incorporate more innovative use of technology and course instruction methods, to ensure that the Wake Forest MBA will be as relevant in the future as it is now, and remain a top college value. The Bay Area MBA, offered by the UC Davis Graduate School of Management, believes that business can work to make the world a better place. With their core values of corporate responsibility, moral and ethical leadership, diversity, and collaboration, UC Davis has designed a curriculum that focuses on real problem-solving and critical analysis, preparing students for any field. The full-time MBA program is convenient, with most courses held on Fridays and Saturdays to work around students’ professional schedules. And of course, as a residential student, you get the incredible quality of life Davis, CA has to offer, including mild, sunny weather, amenities for active lifestyles, and proximity to San Francisco and Sacramento, where the tech industry and other business opportunities thrive. The University of South Carolina’s Moore School of Business is highly ranked by Bloomberg Businessweek, with three innovative MBA programs. The International MBA is quite exciting, including language-immersion programs in French, German, Portuguese, Spanish, Arabic, Chinese, and Japanese, with an intensive Global Consulting Project that combines an internship with a consulting project. This International MBA goes well beyond most other global business programs to prepare students for careers in the global marketplace. The Professional MBA, with U.S. News & World Report’s acclaim, provides a flexible way for working professionals to earn their degree, while the One-Year MBA is an accelerated, 11-month program to get your degree completed and get you out in the workforce in the shortest possible time. All of these options give you good reason to consider the University of South Carolina an investment worth your time and money. The Eccles School of Business, at the University of Utah, takes the MBA very seriously. So seriously that first-year students are discouraged from working and encouraged to dive head-first into the full-time MBA experience, including clubs, student government, and other activities, with the reassurance of knowing that MBAs make higher salaries, bigger bonuses, and better decisions than those without. If Eccles’ belief in hard work and high performance scares you, better to choose one of the “easy” programs out there – Eccles’ doesn’t want you. But if you want a deep, challenging, and rewarding education, you might be what they’re looking for. The Eccles’ MBA does not have specializations, instead focusing on broadly-applicable skills that graduates can take into any field, secure in knowing they can handle any surprise that comes along. The Boston College MBA, from the Carroll School of Management, offers a traditional 2-year MBA and an Evening MBA that typically takes three years. Those simple facts probably aren’t exciting. What is exciting is that Boston College is a long-standing university with a wide-spread and extremely loyal alumni roster, and is situated in one of the major business and finance capitals, Boston, MA. That means not only do Boston College MBAs get an education of the best quality, but that they also benefit from a wealth of mentors, connections, and opportunities, from internships to post-graduation employment with high average salaries to provide a promising return on their investment. The Neely School of Business at Texas Christian University offers full-time and part-time programs toward the MBA degree. Full-time students can choose from an accelerated one-year program (which tailors the degree to the student’s resume, but requires students with work experience and a BBA), and a traditional two-year program (more in-depth). Part-time students can also choose Executive, Professional Evening, or Professional Accelerated programs, as well as a unique MBA for Energy Professionals program designed for workers in the energy fields (especially oil, this being Texas). The Neely School of Business has high marks from Businessweek, the Economist, and others, meaning an MBA from TCU has a proven value. The freshly-renamed Questrom School of Business (formerly the Boston University School of Management) is named for benefactor Allen Questrom, a giant of the retail industry. Questrom’s gift is part of Boston University’s continuing efforts to push business conventions and educate the next generation of great business leaders. With that goal in mind, the Boston University Two-Year MBA is a challenging cohort-based program focused on teaching student to compete in the global business environment. Students choose concentrations such as International Management or Energy and Environmental Sustainability, or specialized degrees like the Health Sector MBA or the Public & Nonprofit MBA, as well as international field seminars in India, Asia, Brazil, or Europe. Career outlook is bright – alumni number in the hundreds of thousands, and graduates stand a much better-than-average chance of finding their way into a high-paying, rewarding career. The Eller MBA, from the University of Arizona’s Eller College of Management, is ranked by Forbes, Financial Times, and U.S. News & World Report. Available in three different formats – the traditional full-time MBA, the more flexible Evening MBA, and the Executive MBA – the Eller MBA trains students in up-to-the-minute concepts and skills, with pioneering faculty and the McGuire Center for Entrepreneurship, one of the best institutions of its kind. Students get the advantage of working with real investment portfolios, taking on consulting projects, and visiting international locations, all designed to prepare students for the real work they will be doing upon graduation. And they will be working: Eller alumni can be found all over the world, using their investment to further a satisfying career. Come to CU Boulder for the Leeds MBA, stay for the culture and social consciousness. The MBA from CU Boulder’s Leeds School of Business is offered in full-time and evening programs, with the same accomplished faculty and tightly knit cohort format, a course design yielding a 90% graduate rate by students keeping one another on track. The Evening MBA is offered on both the Boulder and Parker, CO, campuses for added convenience. The Full-Time MBA has four areas of specialization: Finance, Marketing, Management, and Systems Operations. Along with accolades from all the major ranking networks, CU Boulder students can look forward to their access to the business communities of Boulder and Denver, where tech start-ups and sustainable companies have changed the landscape of business in the west. Put on your hiking shoes and head to the Rockies for a great value in your college investment! Florida International University’s College of Business has a wealth of MBA programs to fit every kind of student, from the specialized Healthcare MBA and International MBA, to the Executive MBA, and three options for the Professional MBA (Flex, Downtown, and Weekend). FIU, a relatively young university (founded in only 1965) has grown to the 2nd-largest university in Florida, acclaimed by U.S. News & World Report and others, due to choices that amount to smart business in education: curricular rigor and excellence (their standards are among the highest), strategic diversity (one of the highest rates of degree-granting to minority students), and excellent financial aid (some of the least-indebted graduates in the US). All of that smart business practice finds its way into the MBA program, where students are prepared to enter the professional world of the 21st century. Plus, with their location in Miami, FL, you may never want to leave – or need to, considering Miami’s thriving business scene. The University of Oklahoma’s Price College of Business offers a Full-Time MBA and a Professional MBA (meeting at night). Students can specialize in Energy (still a rare, but highly sought, field), Entrepreneurship, Finance, Management Information Systems, and Risk Management, and the 8-week module format allows students to start on electives earlier than a standard semester format, so you can begin gaining knowledge in your speciality ahead of competitors at other schools. Price offers not only standard summer internships in and around the UO home in Norman, OK, but domestic and international internships in London, Dallas, Houston, and New York City, while the efforts of the Student Support Center will help connect students with recruiters and employers. These advantages, plus a reasonable cost, make the University of Oklahoma a solid college value. George Washington University’s unique program arises from its unique location: Washington, DC, our nation’s capital and the center of world events. DC has a confluence of government, private sector, non-profit, and NGO institutions and organizations, domestic and international, all coming together to form a business community of great complexity and potential, and GWU’s School of Business prepares students to navigate and thrive in that potential. Recently redesigned, GWU’s MBA program is more flexible and customizable than ever, with 15 concentrations and hundreds of electives for students to focus on their particular career interests. It’s an experience like no other, an incredible investment for students who thrive in a collaborative, competitive environment. The University of Missouri’s Trulaske College of Business puts its biggest claim to value right on their front page – 74% of graduates finish their MBA program with no debt. These days, starting at zero is starting ahead for most students, so it’s not hard to turn your degree into a high return on investment when your financial investment turns out to be nothing. This U.S. News & World Report Best Business School is also affordable to begin with, so Mizzou’s Crosby MBA is an all-around value. Students choose from specializations in Finance, Management, or Marketing, with fifteen concentrations including Investment, Consumer Products Marketing/Brand Management, and Entrepreneurship and Innovation Strategy. Numerous career development services, and a large alumni base, help students find work after graduation, completing a smart investment in your career future. The Ole Miss Campus MBA is a 1-year MBA program designed for working professionals to get their degrees and get back out into the workforce as smoothly as possible. Forbes and U.S. News & World Report have praised the University of Mississippi as a value, and while the Ole Miss School of Business is the largest in Mississippi, class sizes are kept on the smaller side to help students better build connections. With numerous career workshops, job fairs, competitions, and other professional development options, Mississippi provides students with ample opportunities to find work with their stable of corporate partners. With low tuition and a solid grounding in business practices, the Ole Miss Campus MBA lives up to its reputation as a good value. The Manderson MBA, from the University of Alabama’s Manderson Graduate School of Business, offers students seven concentrations, including Business Analytics, Enterprise Consulting, and Financial Risk, taught by dedicated faculty in a facility rated #3 by the Princeton Review for its technological advancement. Rated as one of the best returns on investment, Manderson Graduate School has a career center dedicated to helping its graduates find placement, as well as a unique STEM Path to the MBA for college juniors with high GPA and test scores to enter the MBA program early, ensuring them a slot in the contemporary science-fueled business world. Manderson’s dedication to preparing students for the future, not just the present, is the leading reason ‘Bama finds itself one of the best college values in the US. The College of William & Mary’s Mason School of Business gives you one massive advantage: the William & Mary name, synonymous with excellence since – well, since before there was a United States at all. The Full-Time MBA from W&M offers students unprecedented, innovative learning formats, including seven concentrations (from Business Analytics and Consulting to Operations & Supply Management), as well as two new Paths of Distinction in Health Sector and Real Estate. In addition to these, Mason also offers intensive, 7-week Career Accelerator Modules, deep and challenging courses of real-world problem-solving, case study, and meeting with corporate executives and professionals. Plus, every students gets an individual Executive Partner, a working corporate executive who will guide and advise students, not to mention help them find employment after graduation. The Thunderbird School of Global Management has the single greatest name in business schools. Recently acquired by Arizona State University, the Thunderbird School of Global Management is highly ranked by Forbes, Businessweek, U.S. News & World Report, and others, and with their laser-sharp focus on international business, they are an ideal choice for students interested in the global market. Since their affiliation with ASU, Thunderbird has transformed the MBA into the Master of Global Management, an intensive, one-year program that prepares students with courses such as States and Markets, Global Negotiations, and Big Data. While tuition is higher than most of the schools on our list, the excellent prospects Thunderbird provides its students still makes it a top value.